150 mm of it came on Monday – Tuesday and included a wild but very localised storm around 5 a.m. on Tuesday which completely wrecked a dozen houses and damaged many more, about two suburbs away from us (ABC report and photos here). 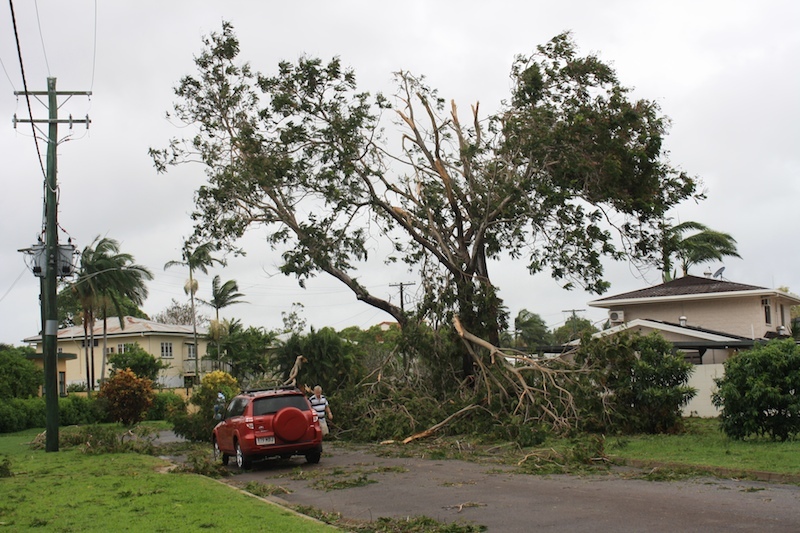 We were woken by its noise but not affected by it, thank goodness: those who were unlucky enough to be in its path now have to deal with Yasi-level damage just a year after that cyclone. 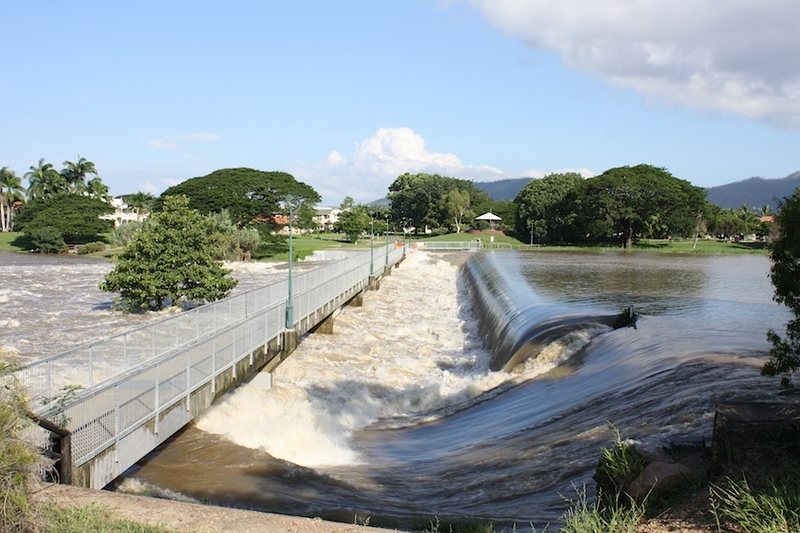 I went down to Aplin’s Weir yesterday (Wednesday) afternoon, on Ross River just upstream from us, to take the obligatory flood photo. I now have a collection of them, at least one per year, because the river reaches this level after any big rain event. It’s still very impressive. 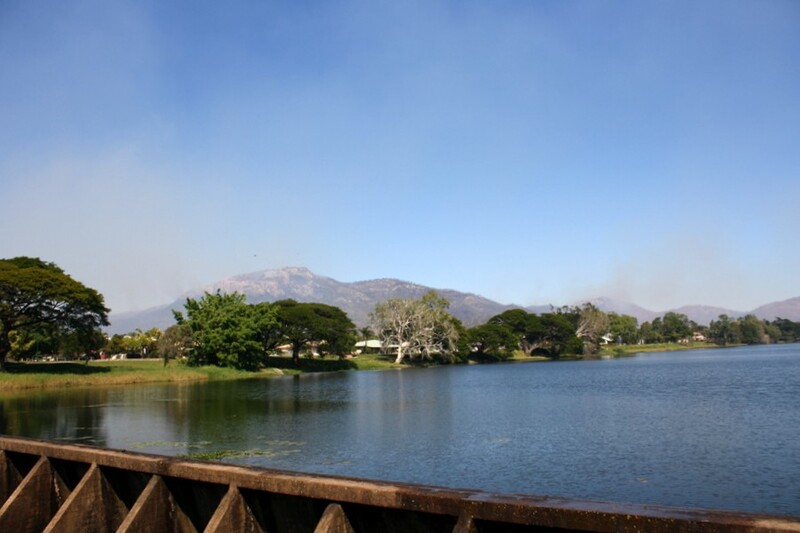 By way of contrast, here is a photo taken from the footbridge last July, in the middle of our dry season (note the smoke from fires in the hills). 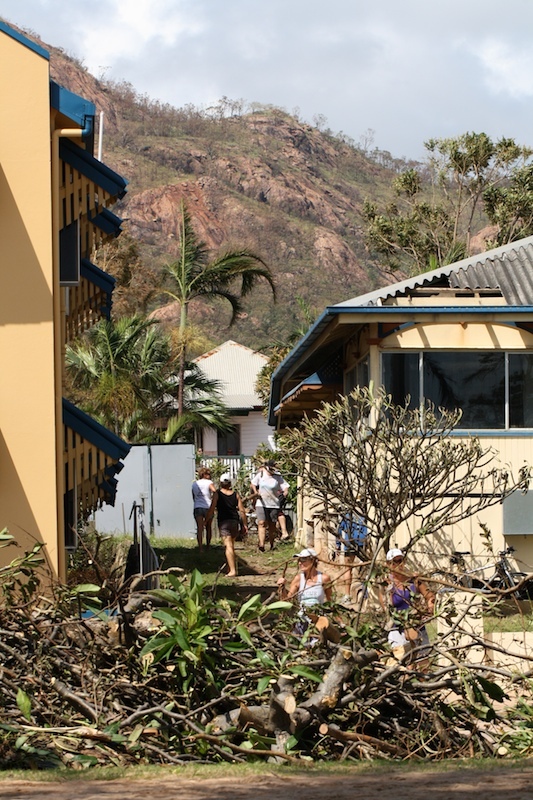 It’s a year this week since Yasi crossed the coast between Townsville and Cairns, affecting both cities to an extent but devastating the smaller towns, especially Tully and Cardwell, in between. 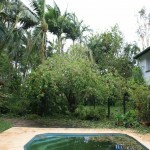 It was the biggest cyclone ever to cross the Australian coastline, though perhaps not the most intense. Our own memories of the event are of trepidation, anxiety, relief and a lot of inconvenience and hard labour. 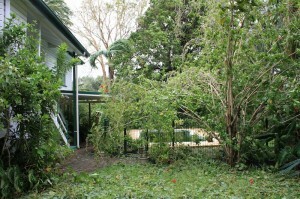 We spent hours beforehand preparing the house and yard, as best we could, for the wind and rain. We lost mains power halfway through the afternoon, cooked and ate dinner by gas stoves and lanterns, listened apprehensively as the wind built through the evening, and got as much sleep as we could during the night – which wasn’t much. 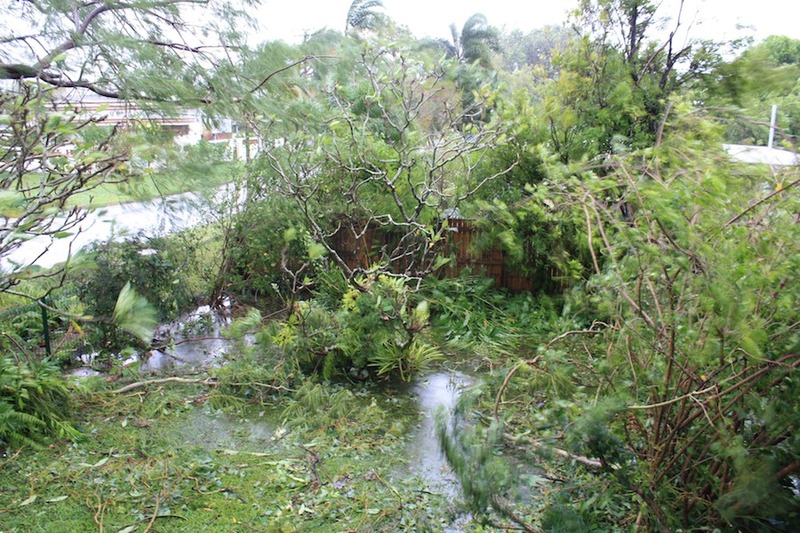 Yasi crossed the coast in the middle of the night, which meant all we knew was what we could hear: lots of wind noise, rain, and the crashes and thumps as debris hit the walls or roof of the house. 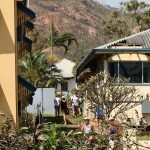 The centre was far enough away so that the eye didn’t pass over Townsville, so we didn’t experience the lull and wind change that you always read about with cyclones – all we got was the gale steadily but very slowly building through the afternoon and evening and dying away just as slowly from midnight to mid-morning. First light revealed a mess in our yard and street but it was still far too windy to be safe to venture out – I made my first tentative foray into the street at mid-morning. What I found was nowhere near as bad as what we might have had. Trees and branches had come down, sometimes damaging roofs, but houses were essentially intact and streets were passable on foot if not by car. And we hadn’t had nearly as much water as we had expected: Yasi had slowed down as it approached the coast and arrived well after high tide, not with it, and the feared storm surge hardly happened. 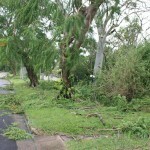 It didn’t bring as much rain, either, as some smaller cyclones have done. That day and the following week or so brought the hard work and inconvenience. We had no power until, I think, the Sunday, and we had to continue as best we could with gas, candles and torches. Fridges were quickly thawing and there was no ice because no-one else had power either. The garden needed a lot of work, clearing branches and leaves (we hired a large skip rather than wait for council collections, but we still had enough for an enormous compost heap) and cleaning out the pool; the house had to be returned to normal after our bout of lifting, packing and waterproofing; while some of us had to go back to work as soon as we could. 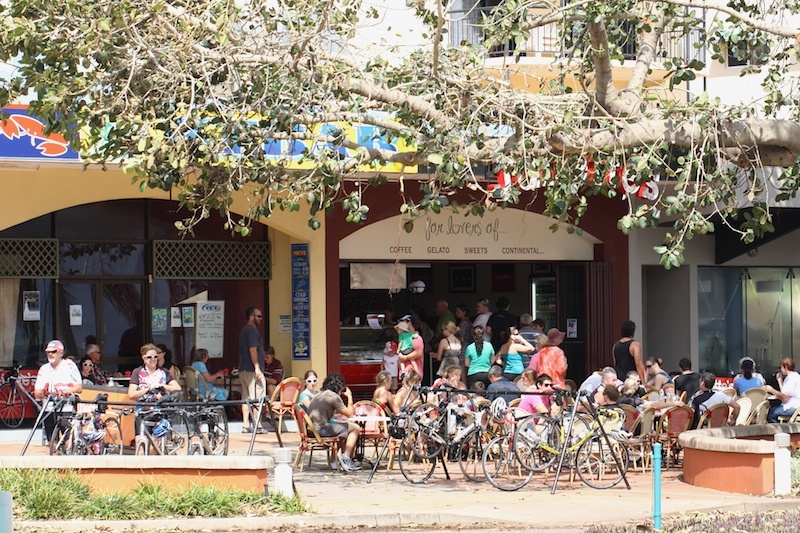 Here are some post-Yasi photos, taken around the house on the morning after, then on the Strand on the Sunday after, then up on Hervey’s Range, also on the Sunday. As usual, click on the small image for a larger one. 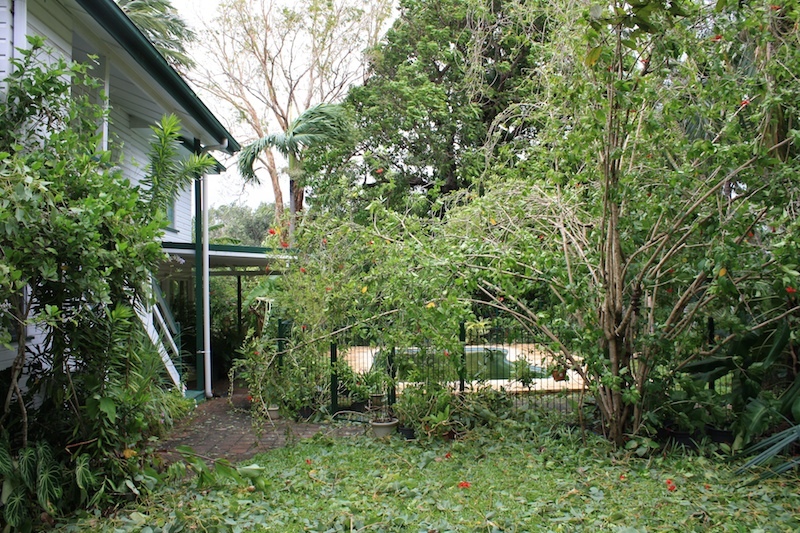 The paperbark was stripped and the bananas collapsed but the mango was hardly touched. 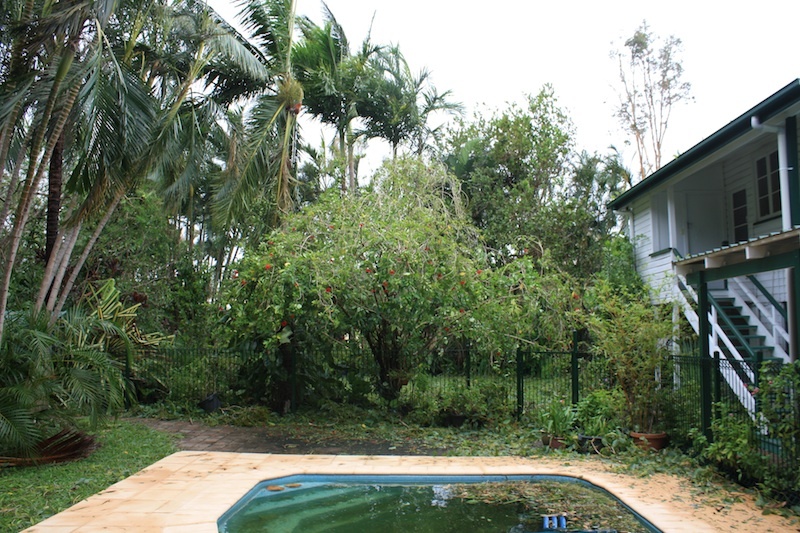 The pool was full of leaves from the poplar gum. 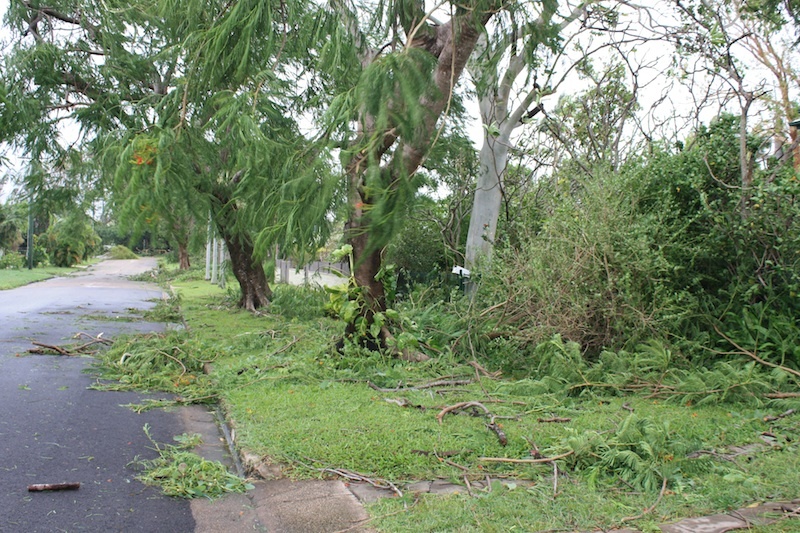 Looking down Water St: a big spiky shrub fell over but the poincianas only lost small branches. 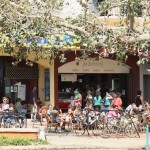 Cafe life on the Strand after Yasi looked almost normal, in spite of heavy cleanup work going on nearby. 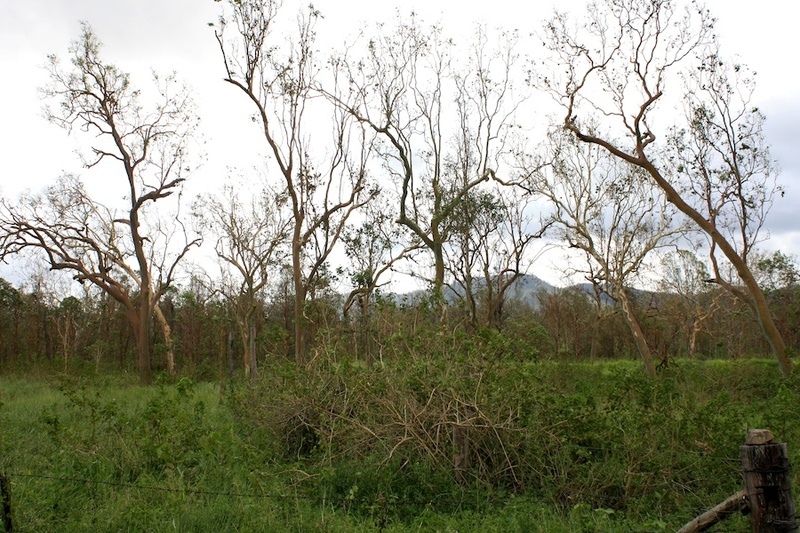 Bushland on Hervey's Range after Yasi. First impressions were that it had gone brown, because we saw trunks and branches instead of leaves, and bright.